There are a ton of articles here at Nukepro related to Hawaii Earthquakes and Volcanos. Its a subject near and dear to my heart as I lived in Hawaii and maintain a residence and business. And I have played in the field of Citizen Scientist for over a decade now. I follow the Sun, Solar Cycles, Earthquakes, Radiation and Galactic Cosmic Rays, Earth magnetic pole shift, and a bunch of other things. really large earthquakes happening on a cyclic basis, and usually early morning late night. So I tried to figure out the pattern causation, it went along with a quiet period of earthquakes over 2.5, then a "fast period" or swarm if you like. So I figured it was sun related. When the portion of earth is facing the sun, the local magnetic field in the ionisphere was enhanced, and repelling of Galactic Cosmic Rays (Gamma Rays) was enhanced. 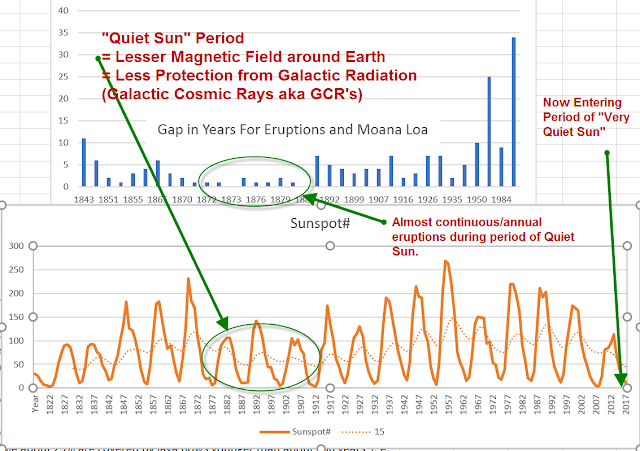 As Hawaii rotated away from the sun, the protective shield was reduced and more GCR's came in. I knew that GCR's nucleate clouds in the atmosphere. So I had an intuition that perhaps GCRs also "nucleate" Magma chambers and cause earthquakes and eruptions. It turns out that my "discovery" is supported in several scientific texts. In Hawaii the USGS was putting out excellent reports daily, with Scientist Jessica Ball doing a video recap everyday. Then on June 14th those videos abruptly ended. And an effort to downplay the eruption and signficance of earthquakes was clearly established. The tourism had dropped off 50%, which is diasaterous for a place that relies 90% on tourism. So someone had read the USGS the riot act. "They" again. Then in late July a new narrative was started. The narrative that Moana Loa (the biggest Volcano in the world) Erupts every 6 years. I thought this was curious, because Mauna Loa had never erupted in my 30 years in Hawaii. So I grabbed the data....amazing yes, to think that someone would actually use real data to form an opinion, or create a hypothesis or theory. I was thinking of the Dalton Minimum (click the blue for a hyperlink), but I also knew that the 1870 and on range was another fairly quiet sun zone. So I pulled that data and made the charts above. The "Volcanic Record" is not that good for Hawaii, they didn't have a written language. Captain James Cook was killed in 1779 after trying to take the Island King hostage in order to get back a small boat that some Hawaiians had stolen. 1832 starts the official volcano records. period in which it erupted almost every year. So the meme, that Moana Loa erupts every 6 years, is a ploy to pre-placate a population put at risk by "Failure to Warn". Moana Loa has only erupted 3 times since 1950, roughly once every 25 years on average, but the last time was 34 years ago, so it is way overdue. And now we have a "Very Quiet Sun". 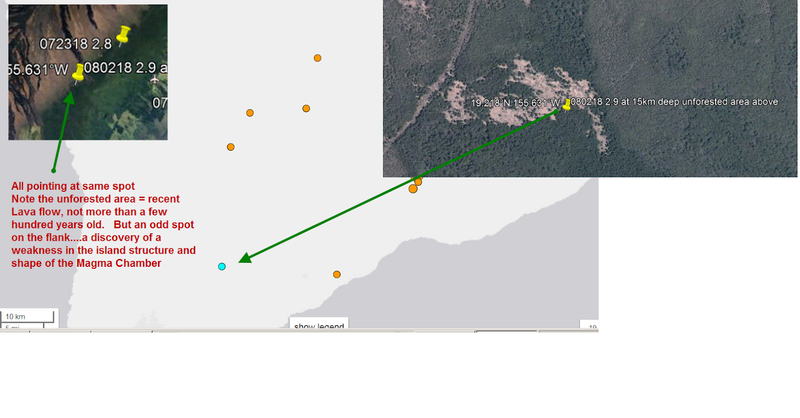 Above in a new quake, today, in a non forested zone, surrounded by forest. The conclusion should be obvious.